Yesterday was quite a day. Yesterday was an amazing spiritual confluence: in the Jewish calendar it was Rosh Hodesh Tammuz, the first day of the month of Tammuz. For Muslims, the holy month of Ramadan began. And Pope Francis issued a major encyclical on the environment, which hopefully promises to change the way we address climate change. 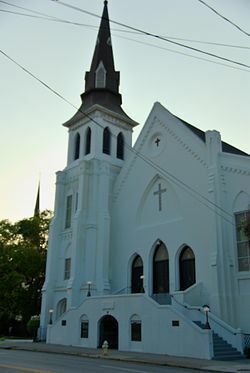 And we woke up to news that the Emanuel AME Church in Charleston, SC—an African American church deeply rooted in history—was the site of a horrible racist attack that resulted in the shooting death of nine people, including the pastor (who was also a state senator). At time in which we are deeply confronting the history of institutionalized racism and privilege—from police shootings (including the one in Olympia) to the identity adoption of Rachel Dozelal—we are confronted with this particular act of terror, this particular act of violence based in hatred. Today: Rosh Hodesh (new moon) of Tammuz, the beginning of Ramadan, the Pope released an encyclical on the environment, and news of a tragic shooting at a black church in Charleston. May we have the strength to overcome our fears and hatreds, and clarity of vision to put aside violence and embrace hope and peace. This shooting struck a particularly deep chord because of the time and place: it took place during a bible study at church. The shooter apparently had joined the group an hour before he began shooting—he was thus welcomed and included in a sacred space at a sacred time. The church—meant to be a place of safety and sanctuary (in the many meanings of the term)—was violated. Because of this violation of sacred space, it felt like a sacred response was needed. A few colleagues and I, with the help of Interfaith Works, hastily arranged a vigil in Sylvester Park yesterday at 5:00 p.m. It was a time for being together in grief and to renew our commitment to peace and justice. We prayed, we sang, we read the names of the dead and we offered words of Scripture. We came together as victims and allies to mark this one tragedy and locate ourselves within the larger narrative of violence and racism in our country. It was a powerful gathering. My Episcopalian colleague the Rev. George McDonnell shared this wonderful litany she wrote. And to honor the fact that the shooting victims were engaged in sacred text study at the time of their deaths, I offered a short passage of Scripture. With the new month of Tammuz which we entered into yesterday comes a period of mourning in the Jewish tradition. The 17th of the month is a minor fast day which begins a three-week period which leads to a major fast day, Tisha B’Av. It is on that day that we mourn the destruction of the ancient Temple in Jerusalem. Through noting this historic event, we turn our attention to the themes of communal disruption, baseless hatred and disunity in the community—all reasons given by our Sages for the Temple’s fall. In other words, the physical destruction of a communal institution is a symbol for the inner failure of community. The work continues. Let us all come to a place in which we can bring about lovingkindness, justice and righteousness in our world, so that all peoples can delight.